There are many reasons for performing a perinatal necropsy, foremost of which is identifying an accurate cause of death. 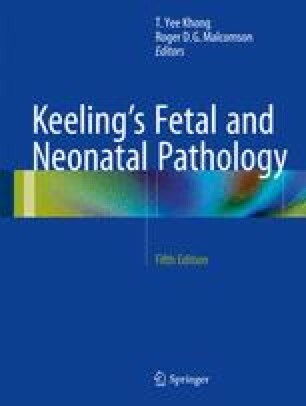 Pathologists and administrators who fail to understand the importance and enormity of the problem of stillbirths and neonatal losses and the important role of the necropsy fail the many parents who suffer these losses. By doing so, it can also exclude some causes of death and identify disorders with implications for counseling for the family as well as for future pregnancies. The standard of perinatal necropsies is far superior when performed by pediatric pathologists to when histopathologists other than pediatric pathologists perform them, and this may necessitate the regionalization of perinatal services. This chapter summarizes the equipment requirements and formalities for performing a necropsy. The necessary preliminary examinations and investigations prior to any dissection, such as mensuration to document growth, imaging, and photography, are discussed. A proposed method of dissection of the body is provided, and the reasons for sampling for histology, biochemistry, microbiology, and molecular studies are provided. Healthcare Improvement Scotland. Scottish perinatal and infant mortality and morbidity report 2011. Edinburgh; 2013. http://www.isdscotland.org/Health-Topics/Maternity-and-Births/Publications/2013-03-26/2013-03-26-SPIMMR2011-report.pdf. International Agency for Research on Cancer. Globocan 2012: estimated cancer incidence, mortality and prevalence worldwide in 2012. WHO; 2014 [updated 29 Sept 2014]; Available from: http://globocan.iarc.fr/Pages/fact_sheets_population.aspx.